I saw the picture below at the Chosun Ilbo dated July 23. The caption reads: "A sand storm recently blanketed the area where Korea’s Zaytun Unit is stationed in Irbil, northern Iraq./Homepage of the Zaytun Unit"
Being the research freak that I am, I started reading on dust storms (the picture is of a dust storm). Lo and behold, I came across the exact same picture at an another web site. It seems that the picture was actually taken at Al Asad, Iraq on April 26. So I decide to check out the homepage of the Zaytun Unit. Sure enough, the photo was at the bottom of their page. The caption there reads: "신이시여, 이것이 진정 모래폭풍 맞습니까?" (roughly: God, is that really a sand storm?). The caption there doesn't claim that it is a picture of the Zaytun base but I can understand why someone at the Chosun would have assumed it was. No harm really, I just think someone at the Chosun might want to pull the picture. 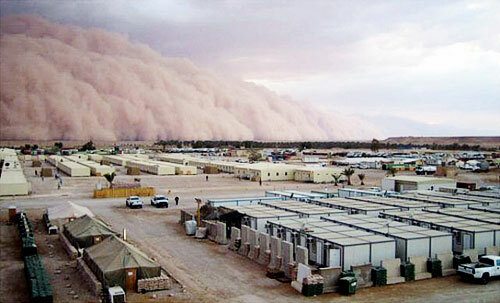 Being a veteran of the Iraq War I can tell you that the picture actually describes what the sandstorms there are like. The first one I saw was almost a surreal experience because everything was so calm and this wall of darkness just kept slowing approaching in the distance until it finally reaches you. When it does reach you the calmness you experienced before suddenly feels like you are being poked by needles on any exposed skin because of the blowing sand. I went through a number sandstorms there and it is not an experience I am eager to repeat.